Just in time for Mother’s Day! These are not simply another take on my Orange Currant Scones or my Almond Oat Scones. Those I make frequently because they’re super quick to pull together, gluten-free and relatively low fat–relying just on plain yogurt to bring the batter together. 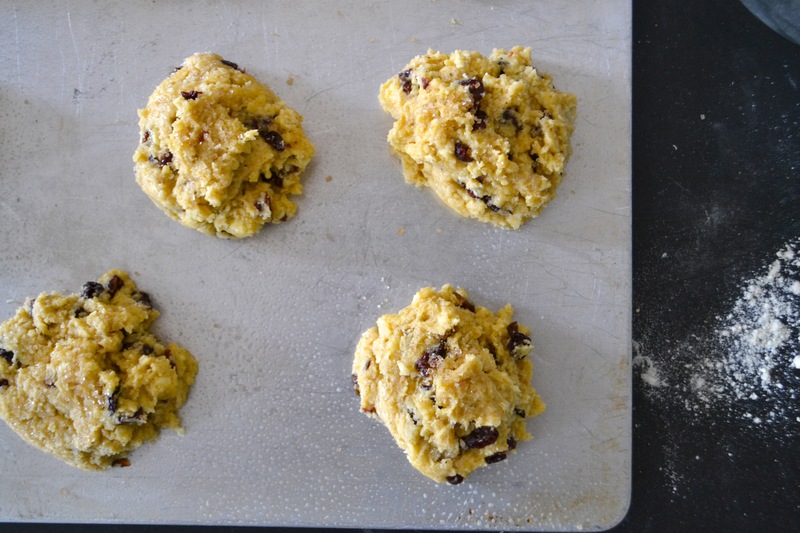 This recipe uses good, old-fashioned butter (and eggs) and results in a much more traditional scone–minus the gluten, of course. I first made this recipe using chopped dried cherries. (It seems that lately I’m hearing a lot about dried cherries and their high nutritional value.) However, I thought the dried cherries were a tad sour, so I’ve left them out of the title of this posting. Feel free to add them in to your mix of dried fruit, because any combination of dried fruit (e.g., dried apricots, cherries, etc.) works. Preheat the oven to 400°F. Grease (or line with parchment paper) a baking sheet. Whisk together the flours, sugar, baking powder, xanthan gum, salt, nutmeg, and cinnamon. Using a pastry cutter, or the old-fashioned two knives technique, cut in the cold butter until the mixture is crumbly. Stir in the chopped dried fruit. Set aside. Whisk together the eggs, milk, and vanilla until frothy. Add to the dry ingredients and stir until well blended. The dough will be quite sticky. 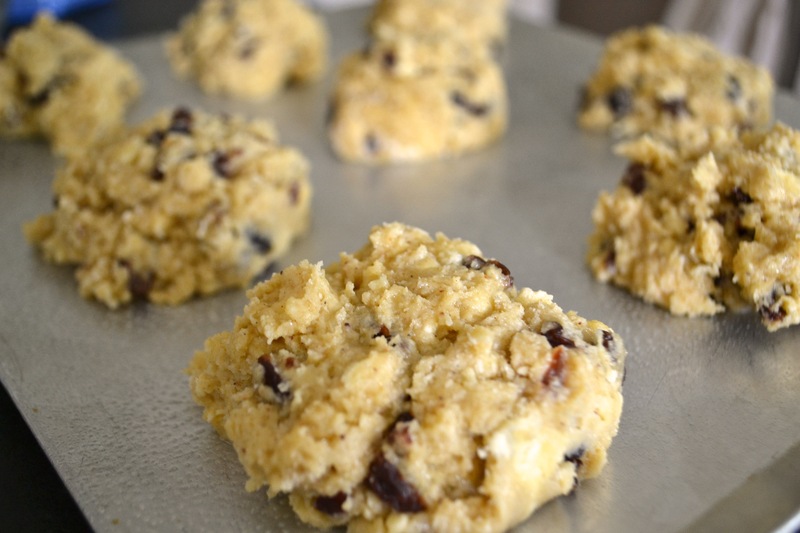 Drop dough by the 1/3-cupful onto the baking sheet. 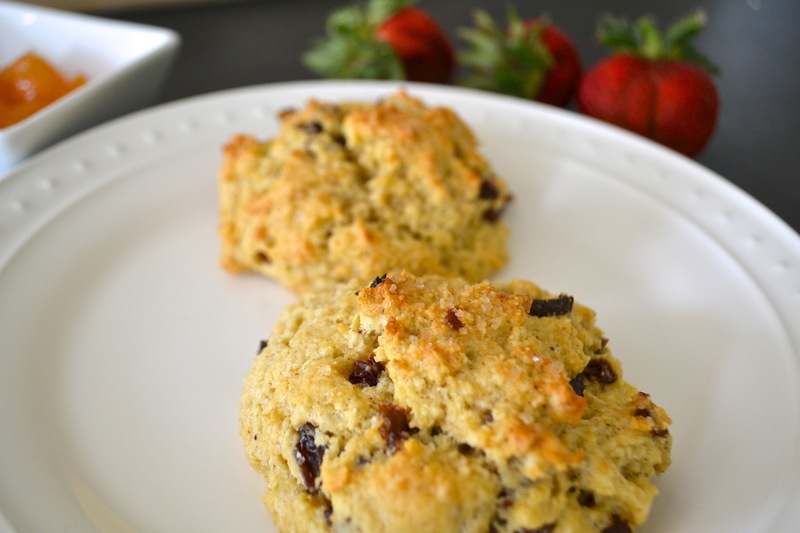 Let the uncooked scones rest for 5-10 minutes. Sprinkle the scones with large-grain Turbinado sugar crystals. Bake for 15 to 20 minutes or until golden brown on the edges. Remove from the oven and let cool for 5 minutes. Serve warm with a little honey or jam. *A note about flours: If you follow this blog, you’ll have noticed that most of my baked goods involve at least two or three different kinds of flours. That’s because when I bake gluten-free, I don’t want to simply remove the gluten. I’m also trying to retain or add back in some of the nutrition that would have been in a gluten containing whole-grain flour, such as whole-grain spelt or barley. With nearly all my GF recipes, you can use just your favorite all-purpose gluten-free flour mix for the combined flour amount–in this case, 1 3/4 cups.